Athrwys (or Arthwys) was the eldest son of King Meurig ap Tewdrig of Gwent & Glywysing. He is generally supposed to have lived in the mid 7th century and Dr Wendy Davies suggests that he did not outlive his father. They may, however, have ruled jointly in the 640s & 50s, after Athrwys became King of Ergyng in right of his mother. Upon the death of his maternal grandfather, King Gwrgan Fawr, in about AD 645, Athrwys - presumably with the help of his father's armies - appears to have seized the throne of Ergyng from his uncles, Caradog & Morgan. He ruled there for about ten years before his death. 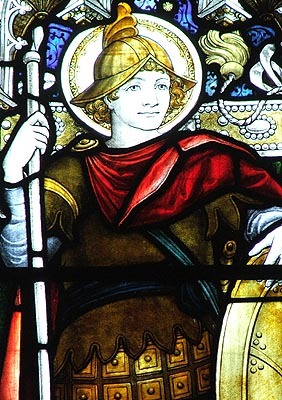 Athrwys may have made quite an impression as a young warrior as well as a king; for it seems likely that many Southern Welsh stories associated with High-King Arthur actually refer to King Athrwys. Particularly relevant are King Arthur's associations with Caer-Legeion-guar-Uisc (Caerleon) which was said to have been one of his major courts. This is, of course, deep in the heart of King Athrwys' home kingdom. Blackett & Wilson followed by Barber & Pykitt further argue that King Athrwys actually was the King Arthur by pushing his lifetime back to the traditional Arthurian period in the early 6th century. They suggest that either Athrwys or his father were buried on Mynydd-y-Gaer in Mid-Glamorgan.